Most Americans support requiring the measles, mumps and rubella vaccine for public school children in order to protect public health. They see high preventive health benefits of such vaccines, and low risk of side effects, and they consider the benefits of the vaccine to outweigh the risks. A new Pew Research Center survey conducted prior to the election finds the “vaccine hesitant” views expressed by Trump and other public figures to be at odds with most Americans’ views. An overwhelming majority of Americans (82%) support requiring all healthy schoolchildren to be vaccinated for measles, mumps and rubella. Some 73% of Americans see high preventive health benefits from use of the MMR vaccine, and 66% believe there is a low risk of side effects from the vaccine. Overall, 88% believe that the benefits of these inoculations outweigh the risks. But there are several groups with comparatively more concern about the safety of the measles, mumps and rubella vaccine. Foremost among them are parents of children ages 0 to 4 who have recently faced or will soon face a decision about whether to follow the recommended immunization schedule for measles, mumps and rubella starting when their children are between 12 and 15 months old. Six-in-ten (60%) parents with children ages 0 to 4 see the preventive health benefits of the MMR vaccine as high, compared with 75% of parents with school-age children (ages 5-17) and 76% of people with no children under age 18. About half (52%) of parents with children ages 0 to 4 say the risk of side effects from the MMR vaccine is low, 43% of this group says the risk is medium or high. By comparison, 70% of those with no minor age children say the risk of side effects is low, and 29% say the risk is medium or worse. 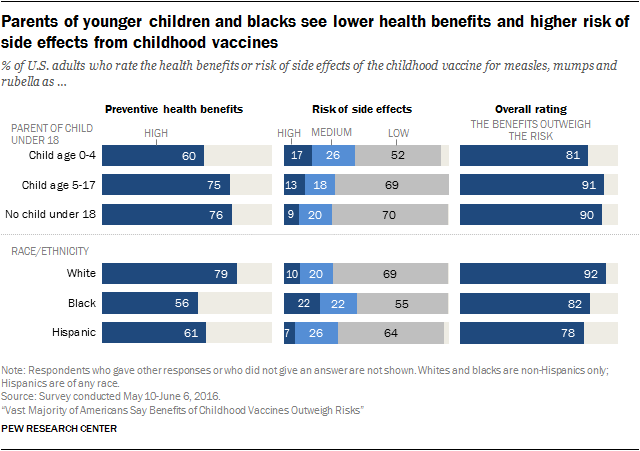 In addition, blacks consider the risk of side effects from the MMR vaccine to be higher and the benefits lower than other Americans. There are also generational differences with adults under age 30 less convinced that the MMR vaccine brings high preventive health benefits. People’s use of alternative and conventional medicine is linked with their beliefs about the MMR vaccine; those who report never taking over-the-counter cold or flu medication and those who have used alternative medicine instead of conventional medicine see higher risk from the MMR vaccine. People with low knowledge about science are also less likely to see high preventive health benefits from vaccines (55% compared with 91% of those high in science knowledge).2 In addition, they are more likely to consider the risk of side effects to be at least “medium” or worse (47% vs. 19% of those with high science knowledge.) Similarly, the 68% majority of Americans who do not correctly recognize the definition for “herd immunity” are less likely to rate the benefits of the MMR vaccine as high and comparatively more likely to see the risk of side effects as at least medium. (Herd immunity refers to the health benefits that occur when most people in a population have been vaccinated.) This group is equally likely as those who correctly recognize the term “herd immunity” to support a requirement for all children in public schools to be vaccinated. Nonetheless, public views of medical scientists and their research related to childhood vaccines are broadly positive regardless of parent status, race, ethnicity and experience using alternative medicine. Fully 73% of U.S. adults believe that medical scientists should have a major role in policy decisions related to childhood vaccines. In addition, a 55% majority say they trust information from medical scientists a lot to give a full and accurate picture of the health effects of vaccines. At the same time people are less trusting of other groups about this issue. For example, just 13% trust information from pharmaceutical industry leaders about the health effects of the MMR vaccine a lot. People with high science knowledge are especially positive in their views of medical scientists and research on childhood vaccines. 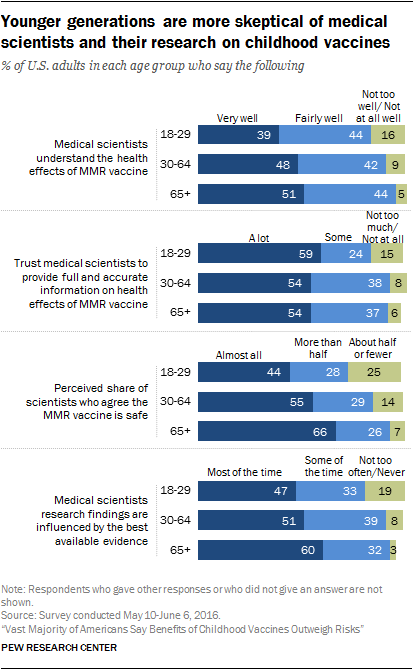 Younger adults, ages 18 to 29, are a bit more skeptical than older age groups about medical scientists and their work on childhood vaccines. The new Pew Research Center survey finds Republicans (including independents who lean Republican) hold roughly the same views as Democrats (including leaning Democrats) about the benefits and risks of the MMR vaccine, consistent with a 2015 Pew Research Center survey on this topic. Republicans and Democrats (including those who lean to either party) are about equally likely to support a school-based vaccine requirement. However, political conservatives are slightly more likely than either moderates or liberals to say that parents should be able to decide not to have their children vaccinated, though majorities of all ideology groups support requiring the measles, mumps and rubella vaccine for all children in public schools because of the potential health risk to others. These are some of the findings from a Pew Research Center survey conducted among a nationally representative sample of 1,549 adults, ages 18 or older from May 10-June 6, 2016. This is the third in a series of reports on public views about science-related issues and public trust in scientists working on these issues. The margin of sampling error based on the full sample is plus or minus 4.0 percentage points. For details, see the Methodology. 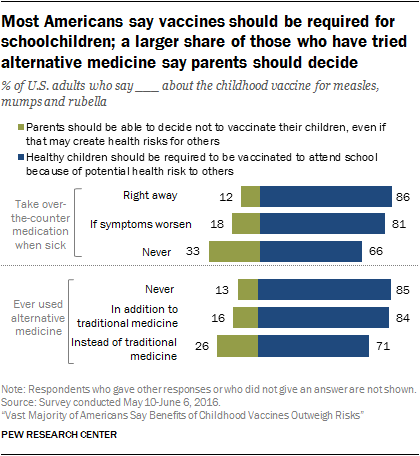 An overwhelming majority of Americans (82%) support having a school-based requirement that healthy children be vaccinated for measles, mumps and rubella. Older adults, ages 65 and older, are especially strong in their support for requiring the MMR vaccine. Seniors, ages 65 and older, support a school-based requirement for the MMR vaccine by a margin of 90% to 8% who say that parents should be able to decide this. 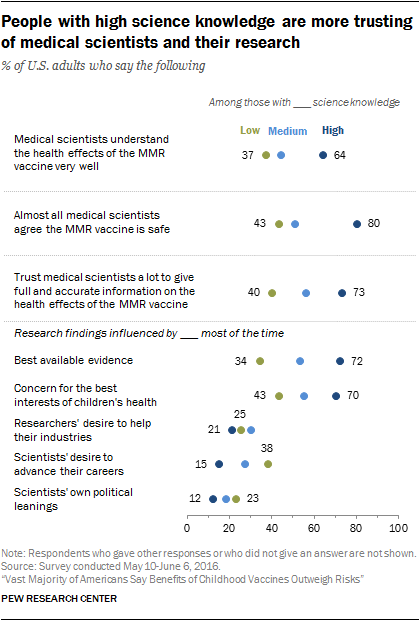 Smaller majorities of younger age groups support a school requirement for the MMR vaccine. Parents of young children, parents of school-age children and those with no minor age children hold roughly similar views on this issue, with a majority of all three groups saying that healthy schoolchildren should be required to be vaccinated because of the health risk to others when children are not vaccinated. 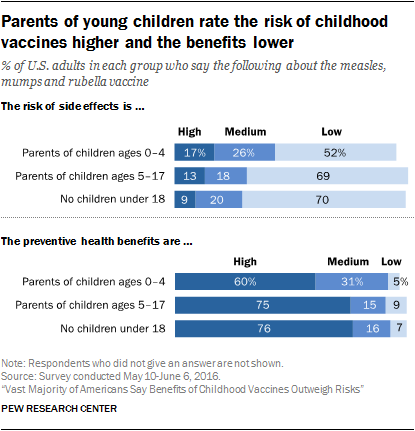 Some 77% of parents with children ages 0 to 4 say that healthy children should be required to be vaccinated for the MMR because of the potential health risk to others when children are not vaccinated, while 22% of this group says parents should be able to decide not to have their children vaccinated even if that creates health risks for others. Conservatives (25%) are a bit more likely than either moderates (15%) or liberals (9%) to say that parents should be able to decide not to have their children vaccinated even if that creates health risks for others. At least seven-in-ten of all three ideology groups say that the MMR vaccine should be required for healthy schoolchildren, however. There are no significant differences in views about this issue by political party in this survey. 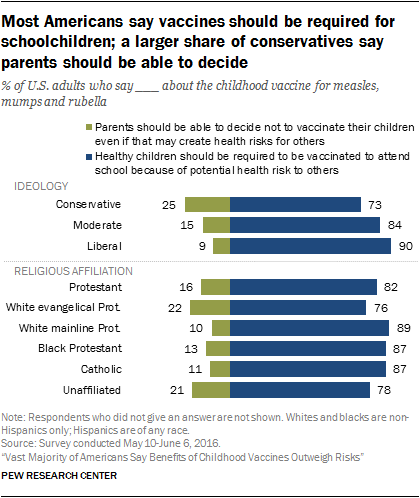 White evangelical Protestants and the religiously unaffiliated tend to express a bit less support for requiring the MMR vaccine and comparatively more support for allowing parents to decide not to have their children vaccinated. Majorities of all major religious groups, though, say that the MMR vaccine should be required for healthy school children. 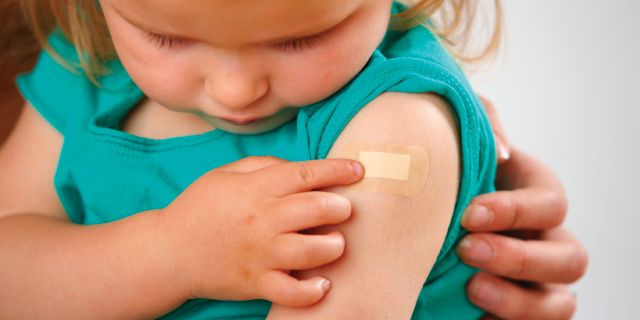 Two additional groups have notably different views about childhood vaccines than others. One is the 20% of adults who report they have used alternative medicine instead of traditional medicine. The other is 8% of Americans who report that they never take over-the-counter medications. Alternative medicine is a broad category including herbal dietary supplements, acupuncture, chiropractic, energy therapies and other therapies that are not part of standard conventional (here also called traditional) Western-based medical care. Many of these alternative therapies have uncertain healing effects although some techniques have been shown to help relieve pain and nausea and are used as complementary treatments in addition to conventional, standard medical care. Another indicator of people’s use of conventional medicine involves their use of over-the-counter cold and flu medications. Some 41% of Americans report that they take such medications as soon they experience cold or flu symptoms, 49% say they wait to take such medications until their cold or flu symptoms worsen, and 8% report that they never take over-the-counter medications for cold or flu symptoms. The minority of Americans who report never using over-the-counter medications for cold or flu symptoms and those who have used alternative medicine instead of conventional treatment are comparatively more likely to think that parents should be able to decide whether to have their children vaccinated even if that decision means increased health risk for others. Most in these groups, however, say that healthy children should be required to be vaccinated in order to attend public schools. 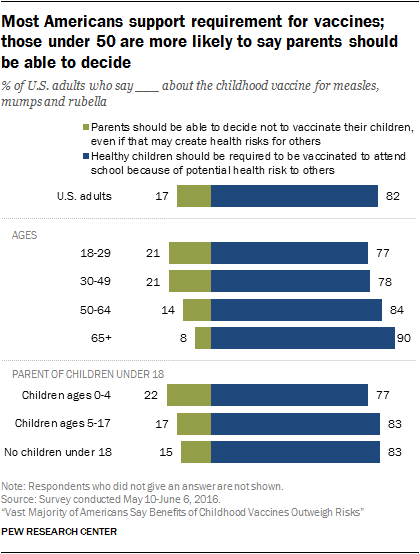 Overall, public perceptions of the benefits and risks of the measles, mumps and rubella vaccine are strongly positive. Some 73% of U.S. adults rate the preventive health benefits of the MMR vaccine as high, and 66% of the public says the risk of side effects from the vaccine is low. About a third (32%) say the risks are medium or high. 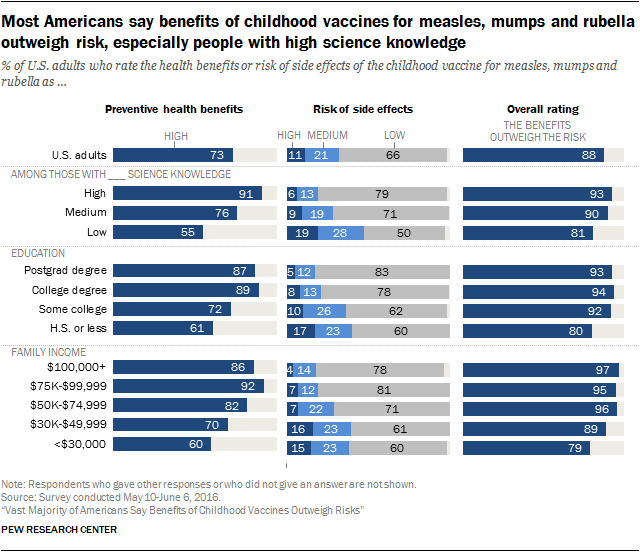 When considering the trade-offs, fully 88% of Americans say the benefits of the MMR vaccine outweigh any risks, while just one-in-ten say the risks outweigh the benefits. Parents with children through age 4 are comparatively less convinced that the MMR vaccine has high preventive health benefits and are more concerned about the risk of side effects. Six-in-ten (60%) of those with a child ages 0 to 4 say the benefits are high, compared with 76% of those with no children under age 18. Some 43% of parents with young children (ages 0 to 4) say the risk of side effects from the MMR vaccine is at least medium, compared with 29% of those with no minor-age children. People with high science knowledge, higher levels of education and higher family income are especially likely to rate the preventive health benefits of the MMR vaccine as high and the risk of side effects as low. For example, 91% of those with high science knowledge say the health benefits of the MMR vaccine are high, compared with 55% of those with low science knowledge. Just 19% of those with high science knowledge consider the risk of side effects from the MMR vaccine to be at least medium, compared with 47% of those with low science knowledge. Reports that affluent communities have lower vaccination rates lead some to speculate that people with higher incomes hold more concerns about the safety of the MMR vaccine. The Pew Research Center survey finds, however, that people with higher family incomes tend to rate the risk of side effects from the MMR vaccine as low. Those with higher family incomes are especially strong in their support for a requirement that all children be required to be vaccinated against MMR in order to attend public schools. The 8% of Americans who report never using over-the-counter medications for cold or flu symptoms are comparatively less convinced of the preventive health benefits (59% say the benefits are high, compared with 75% among all who take such medications) and more concerned about the risk of side effects from the MMR vaccine (49% say the risk of side effects are at least medium, compared with 31% of all who take such medications). 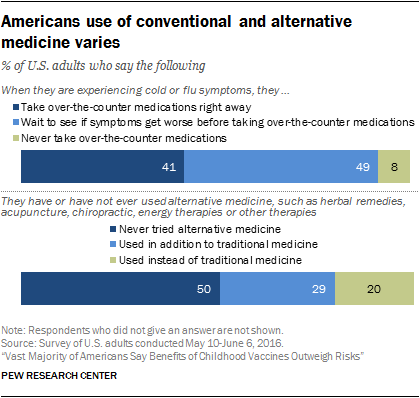 There is a similar, though less pronounced, pattern among those who have used alternative medicine in lieu of conventional medicine compared with other Americans. There are not noteworthy differences in people’s perceptions of the benefits and risks associated with the MMR vaccine by gender, religious affiliation or political groups. Public perceptions of medical scientists and their research are broadly positive. Some 55% of Americans perceive strong consensus among medical scientists that the measles, mumps and rubella vaccine is safe for healthy children. 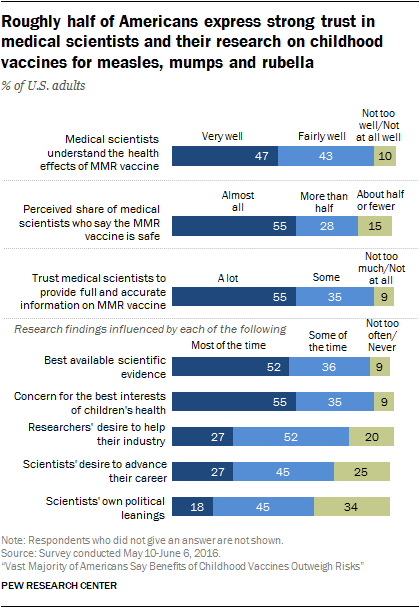 Nearly half of Americans (47%) say that medical scientists understand very well the risks and benefits of the MMR vaccine, 43% say medical scientists understand this fairly well and just one-in-ten (10%) say medical scientists do not understand this at all or not too well. A 55% majority of Americans trust information from medical scientists a lot to give a full and accurate picture of the health effects of vaccines. Public trust in information from other groups is much lower including: pharmaceutical industry leaders (13%), people from holistic or alternative health groups (9%), the news media (8%) and elected officials (6%). Some 52% say that scientists’ research on childhood vaccines is influenced by the best available evidence most of the time, and 55% say such research is influenced by scientists’ concern for the best interests of children’s health most of the time. Smaller shares say that researchers’ desire to help their industries or to advance their own careers influences research on childhood vaccines most of the time. Americans’ views about medical scientists and their work, however, vary widely by people’s level of knowledge about science. People with high science knowledge, based on a nine-item index, tend to be positive and trusting of medical scientists and their work on childhood vaccines. By contrast, a minority of those low in science knowledge perceive medical scientists as understanding the risks and benefits of the MMR vaccine very well, trust information from medical scientists a lot, or think that the best available evidence influences medical research on childhood vaccines most of the time. In addition, there are modest generational differences in views about medical scientists. Younger adults, ages 18 to 29, are less inclined than older adults to see medical scientists and their research in a positive light. While there is considerable variation in Americans’ views about medical scientists’ understanding of childhood vaccines, most Americans think medical scientists should have a role in policy decisions related to childhood vaccines. 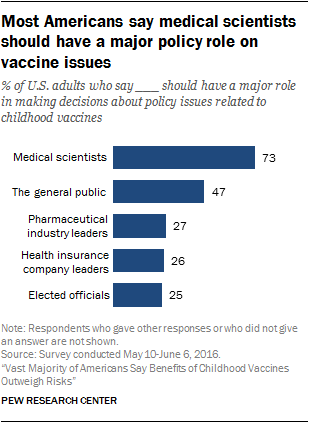 Fully 73% of U.S. adults think that medical scientists should have a major role, 19% think they should have a minor role in such policy-making decisions, and 7% think medical scientists should have no role in vaccine policymaking. Far fewer Americans say that other groups should have a major role in policy decisions on these issues, including the general public (47%), pharmaceutical industry leaders (27%), health insurance company leaders (26%) or elected officials (25%). Asked about a wide range of leaders and institutions, the military, medical scientists, and scientists, in general, received the most votes of confidence when it comes to acting in the best interests of the public. On the flip side, majorities of the public have little confidence in the news media, business leaders and elected officials. Public confidence in K-12 school leaders and religious leaders to act in the public’s best interest falls in the middle, as shown in a 2016 report from the same Pew Research Center survey. Fully 84% of Americans say they have a great deal (24%) or a fair amount (60%) of confidence in medical scientists to act in the public’s best interests. About eight-in-ten or more report at least a fair amount of confidence in medical scientists to act in the public interest across a range of subgroups including gender, age, parents, race and ethnicity, education, political party and ideology and religion. Nearly half of Americans (48%) say the health of children in the U.S. as a whole has declined over the past two decades, a smaller share (31%) say it has gotten better and a fifth (20%) say children’s health has stayed about the same. People’s perceptions of adult health over the past 20 years are slightly more negative than positive as well. People ages 65 and older are the only age group in which a plurality sees the public health of both children and adults as better today than it was two decades ago. A 61% majority of Americans give the media positive marks, overall, for their coverage of issues related to the measles, mumps and rubella vaccine. Half of Americans say they follow news about childhood vaccines very (13%) or somewhat (37%) closely. Fully 73% of this media attentive group says the media do a good job covering issues about childhood vaccines, and 27% says the media do a bad job on this. Parents of children ages 0 to 4 do not differ from other adults in their judgments about media coverage of the MMR vaccine. Most people who have seen a health care provider for treatment needs in the past year say the provider listened to their concerns and cared about their well-being. Roughly six-in-ten Americans (63%) report that they have gone to a health care provider for an illness or medical condition in the past year, and 36% have not. Fully 87% of those who have been to a health care provider within the past year felt their description of their symptoms or concerns were carefully listened to, 84% felt the health care provider “really cared about [their] health and well-being” and 80% say they got all the information they needed for further treatment and at-home care. Only 23% of this group reports feeling rushed by the health care provider, and only 15% felt confused about the instructions they received for further treatment or at-home care. When it comes to making decisions about treatment for a serious health problem, three-in-ten adults (30%) say they “just ask a doctor for advice,“ while some 68% of Americans say they also do their own research, either to check for other treatment options (21% of U.S. adults), to understand potential side effects for a recommended treatment (9% of U.S. adults) or simply to learn more about the recommended treatment (36% of U.S. adults).